For months now, housing pundits have been bemoaning the lack of attention given by the presidential campaigns to the issue of rental affordability. While all across the country local news outlets are highlighting the impacts of the high cost of rental housing, Mr. Trump has been largely silent, and Secretary Clinton has adopted a “more of the same” platform. In “Trump and Clinton Debate Over Housing Is Critical to U.S. Cities,” Daniel J. McGraw takes up the argument again in the wake of the first presidential debate. Mr. McGraw suggests that the fuzziness of the housing issue keeps it from becoming mainstream. The problem is in figuring out how such blatant disregard for the important role housing plays in the economy and how the wealthy using tax loopholes puts an unfair burden on the middle class and the poor will play with voters. In fact, it could be argued that many Trump supporters think gaming the housing market for personal financial gain and not paying taxes is what one should aspire to. That’s why this race has been so hard to figure out. 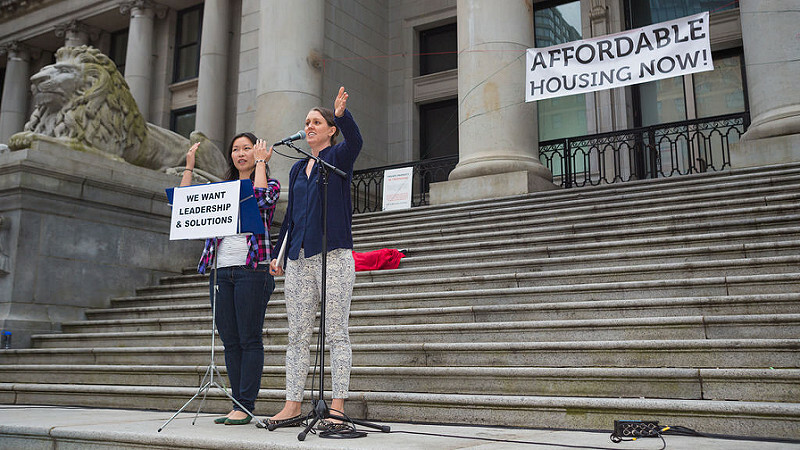 In an effort to put the message of affordability to the public, Right to the City staged a series of “Homes for All” demonstrations around the country last week. As in the past, there was some pretty good local coverage—in particular, the photo spread at Pennsylvania’s nonprofit news site Public Source. But there was scant attention from the national media. It’s easy to say that housing advocates have just been ineffective in communicating their message. One could argue that the gap between renters and elected officials is one of imagination. Renters don’t have firm demands and elected officials (or wannabes) don’t have policy solutions to offer. Still, there’s some reason to believe that advocates are breaking through below the platforms of the presidential aspirants. Three recent congressional hearings highlighted different aspects of the affordable housing story and raised the intriguing possibility of renewed interest in housing policy at the national level. On September 21st, the House Financial Services Subcommittee on Housing and Insurance held a hearing on “The Future of Housing in America: A Better Way to Increase Efficiencies for Housing Vouchers and Create Upward Economic Mobility.” On the same day, Senator Susan Collins (R-ME) chaired a Senate T-HUD subcommittee hearing entitled “Housing Vulnerable Families and Individuals: Is There a Better Way?” And on the next day, the Senate Banking Committee’s Subcommittee on Housing, Transportation, and Community Development held a hearing on “Oversight of the HUD Inspection Process,” chaired by Senator Tim Scott, (R-SC). Florida Senators Rubio, a Republican, and Graham, a Democrat, focused on HUD’s failure to enforce its own rules against privately owned properties with Section 8 Project-based Rental Assistance. Each hearing was led by a Republican chair but featured traditional Democratic issues: affordability, voucher mobility and troubled subsidized properties. Many of the participants in each hearing seemed to be striving to find some consensus rather than “scoring points” in what is, after all, a nearly lame duck session. Finally, none of the chairpersons claimed to have the perfect answer to the challenges, but rather invited a broad scope of opinions be taken into consideration. Reflecting on these hearings, a housing advocate told her peers that HUD witnesses and traditional “housing advocates” seemed “flat footed” in the face of this new Republican interest in housing programs. These hearings are not the only examples of Republican leaders’ renewed interest in economic justice issues. A story in Roll Call describes efforts by Senator Tim Scott (R-SC), who is actively seeking bipartisan support for efforts to address specific poverty initiatives. Nor is the idea of carving out a Republican role in addressing social needs just focused on specific programs. A Washington Post article suggests that think-tankers on the right are tackling economic inequality without demagoguery. NHC welcomes this congressional interest. We are hopeful that this is the start of a more substantive discussion about how the affordable housing community can improve and innovate to serve more families as well as some recognition of the need for more federal resources to meet these challenges.